Although Facebook is by far the largest social network out there, the social network sphere is large and has a ton of players. We were curious about which of them are the most active. To find these sites, we decided to focus on the number of daily visitors to each site. The number of (unique) daily visitors is an interesting metric since it doesn’t rely on registered users (who may or may not be active) or monthly visitors, where some may visit the site as seldom as once per month. In short, you get a good idea of the day-to-day activity on a site. We found 29 social networks that currently have one million or more unique visitors per day. For traffic data, we used Google Trends for Websites. Note that these numbers are estimates made by Google from a variety of data sources, so they will not be 100% correct, but should still give us a good idea of how the sites compare. Facebook has stated that about half of its users log in to the site every day, which seems to match these numbers. It’s interesting that Orkut, counted out by many, clocks in a significant number of daily visitors. From this perspective, it’s the second-largest social network in the world. This is in large part due to it’s extremely strong following in Brazil and to a somewhat lesser extent, India. Facebook dominates to an almost ridiculous extent. Combine all the daily visitors for the other 28 social networks on this list and you still only end up with two-thirds of what Facebook has. For those of you interested in learning more about each network, including the trend of its traffic (some are growing, some are stable, some are losing ground), read on. We’ll go through all of them here below. Needs no introduction, really. 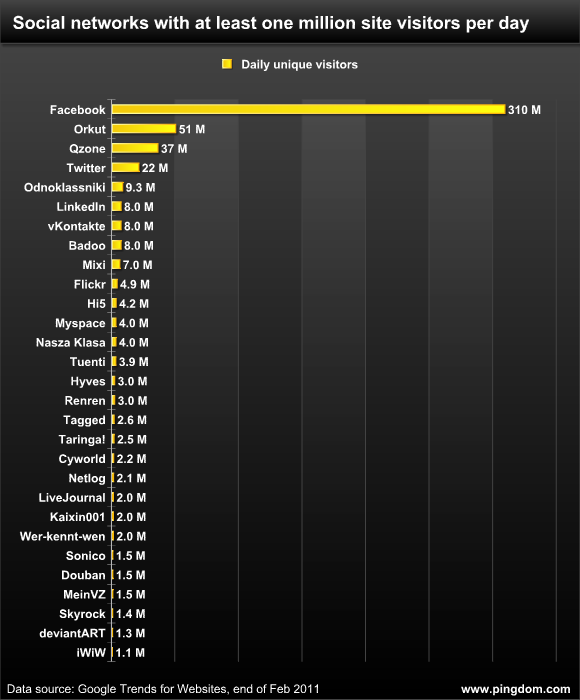 As you could see in the chart above, the daily activity at the Facebook website makes all other sites look small. It should be noted that about 200+ million of Facebook’s 600 million users also use one of Facebook’s mobile apps, which won’t show up here. Launched in 2004. Still no sign of Facebook’s growth slowing down, is there? Google’s entry in the social network field (not counting Google Buzz). Not big in most of the world, but a massive success in Brazil and to a lesser extent, India. Launched in 2004. China’s largest social network, launched by Tencent in 2005. Another site that really needs no introduction, at least to the readers of this blog. It should be noted that these results may be a bit unfair to Twitter since people to a large extent use applications to access Twitter and don’t necessarily surf to the Twitter.com website so much. Launched in 2006. A Russian social network for classmates and old friends (“odnoklassniki” means “classmates”). Launched in 2006. A business-oriented social network that you’re probably already well aware of. Launched in 2003. A popular Russian social network that is often described as a Russian Facebook clone. Launched in 2006. A social networking site that originated in Russia but is now most popular in several Latin American countries, as well as France, Italy and Spain. Launched in 2006. Japan’s premier social network, launched in 2004. Some may think of Flickr as just a photo-sharing site, but it’s always had a strong social element and is listed as a social network in Wikipedia, so we included it here. Launched in 2004. A social network with a global audience, although an extra large share of its users come from Thailand, Mexico, Romania and Peru. Launched in 2003. The former number one social network is not faring so well at the moment, at least when you think about how successful it once was. Launched in 2003. A Polish social network for students and alumni (the name means “our class”). Launched in 2006. If you’re wondering about the oddly shaped graph, it’s because the site switched to nk.pl from a different domain name (explaining that sharp rise). Another site that basically got its start as a local Facebook copy, this time in Spain. It’s often referred to as the “Spanish Facebook.” Launched in 2006. The most popular social network in the Netherlands. Launched in 2004. Another popular Chinese social network. Renren literally means “everyone.” Launched in 2005 under the name Xiaonei. The “late start” in the graph is because that’s when the site changed both its name and its domain name. A social network launched in 2004, somewhat infamous for rather spammy invitation email practices a couple of years ago. An Argentinian social network available in Spanish and Portuguese. Much of its traffic comes from Latin American countries and Spain. Launched in 2004. A South Korea-based social network mainly active in South Korea, but it also has operations in China and Vietnam. Launched in 1999. A social network mainly targeted at European youth. Launched in 2003. Another Chinese social network. Historically, it has received spikes in usage every time China has blocked access to sites like Facebook, Myspace, Twitter and YouTube. A German social network somewhat similar to Myspace. The name means “who-knows-whom.” Launched in 2006. A social network aimed mainly at a Latin American audience. Launched in 2007. A Chinese social network where users discuss and review movies, books and music. Launched in 2005. StudiVZ is a German social networking site mainly for college and university students in Europe, similar to Facebook (actually, in 2008, Facebook sued them for copying its look, feel and features). MeinVZ is an English-language version of this site aimed at non-students. A French social network. Launched in 2002 as a blogging service (Skyblog.com), it became a full-blown social network in 2007. A social network where artists can meet, discuss and showcase their work. Launched in 2000. Short for “International Who is Who,” iWiW is a Hungarian social network. Launched in 2002 as WiW (i.e. the same moniker but without the “international” part). Yes, there are as we all know some social networks that are heavily reliant on mobile apps, which won’t come across here. This survey focused solely on website visitors. If nothing else, this survey clearly shows that although Facebook is dominant, it’s far from the only game in social networking town. Photo credit: Crowd photo by Anirudh Koul (we had to crop it a bit, sorry). Data sources: Wikipedia and Google Trends for Websites. Japan’s Mixi was founded in 2004, not 2000. Over 80% of Mixi’s page views now comes from cellphone (not smartphone), which cannot be tracked by Google Trends for Websites. @Akky Akimoto: Thanks for the correction. Wikipedia for some reason lists Mixi as “launched” in 2000 and “founded” in 2004. Thank you for providing the information I needed.